Update: If you run export DISPLAY=:0 in the terminal prior to npm start, the application runs just fine on the remote device. Thank you Alex! Have you tried ‘export DISPLAY=:0’ I’ve had some success with that in the past re: ssh apps that open GUI things. In working on an project for work, I have figured out the hard way that Electron has to be started from a terminal session on your target device (ie the computer it is to be viewed on). I am developing an embedded system based on the Raspberry Pi that does not take user input but displays information on a screen. Upon downloading the electron-quick-start example, everything installs correctly without error and can be done remotely via SSH. Upon running with npm start, the following error is thrown. npm ERR! 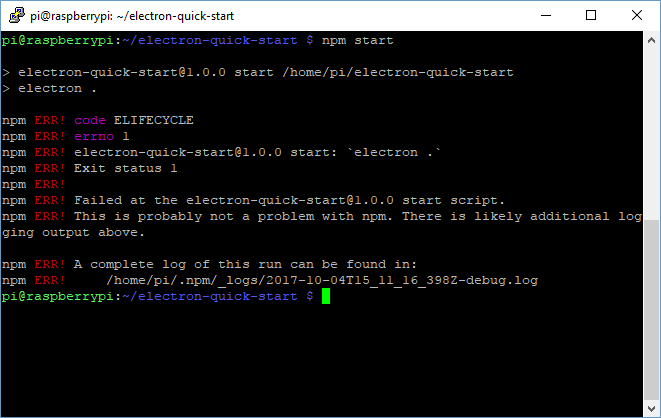 Failed at the electron-quick-start@1.0.0 start script. I spent most of the evening trying to debug npm ERR! code ELIFECYCLE to no avail. On a lark, I connected a keyboard to the device and ran npm start and it ran without error. Sigh. The remote development alternative for doing this is to use Remote Desktop Connection a client comes bundled in with windows. The software can be installed on the remote system (the Raspberry Pi) using apt-get install xrdp. 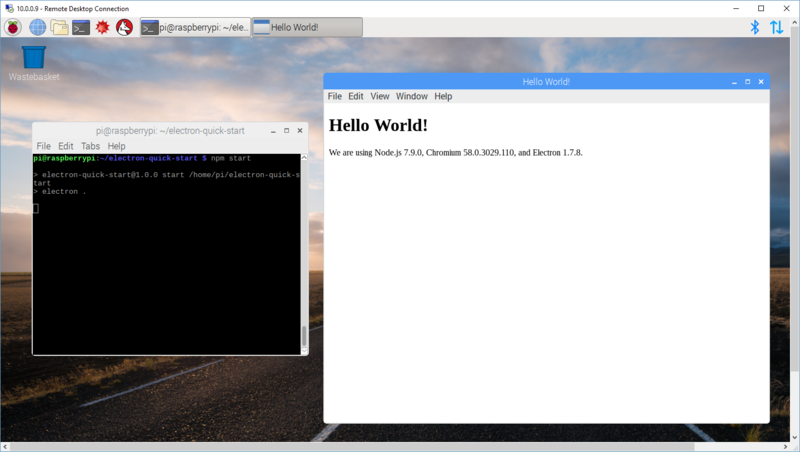 Upon connecting, opening up a shell in the RDP client, and running npm start, the example application works just fine.